We had a very special sight captured on camera recently. Visiting from Germany, Sebastian caught two bottlenose dolphins leaping into the air at the same time. Looks Photoshopped, but it really isn’t! 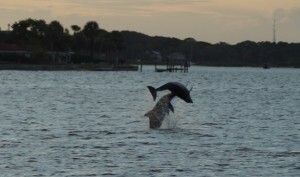 Dolphins leap for a variety of reasons, including communication, food search, and to just have fun. We think this was pure fun and an awesome site for our passengers and us.